Carbon-neutral Bangalore - a tractable goal .. Carbon neutrality is an aspect of our life where we offset the Carbon emissions from our daily activities with other activities that can avoid or offset these emissions. Automobiles and their associated emissions are an inevitable aspect of human development. We could offset these emissions, for example by planting more trees. There are many ways in which carbon emissions could be countered. Kerala State in South India has been working fervently at the world's first Carbon-neutral village in Meenangaadi, Wayanad to be fructified in 2020. Click here for the link .. The idea of a Carbon-neutral Bangalore may be audacious, to begin with. Given the developmental pressures, we all are faced with everyday, it is a long drawn out plan. But the awareness it is bound to create combined with public actions to combat carbon emissions can be a great motivator for the society to move towards a cleaner and safer green environment. Bangalore can be proud as it has for the first time a 100% carbon-neutral campus in the country, PUBLIC AFFAIRS CENTRE. 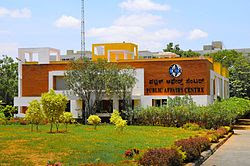 PAC is a 2 acre campus on the Bommasandra Jigani link road. (Click here for the link). This centre has it's own power generation capability, vegetable cultivation, water harvesting plant from the rainfall, waste treatment making it the first totally Carbon neutral campus in the country. A 9.9 KW solar power plant generates almost 50 units of power everyday which is used in the campus. The power generated during the weekend is fed to the BESCOM power grid. A Carbon neutral Bangalore may be a distant dream. But it is just a question of scaling from a campus to a city. What all areas should we focus on ? 1. Energy generation / use related - Bangalore uses approximately 1500 MW of power daily, most of this is coal based, bringing the term dirty power. For example it is said, the 27 MW solar power plant in the Kochi International airport in Kerala, India, enabling it's 100% insolation, reduces the CO2 emissions and it is actually equivalent to planting approximately 6 million trees. 3. Water storage / transportation related - lowering of water table by indiscriminate exploitation of water resources has led to higher usage of energy to pump water. More lakes and water holes can raise the water table. 4. Food production related - usage of chemical fertilizers on the fields has led to soil getting highly acidic and getting wasted and barren, unless treated. Organic vegetable production can benefit nature in the long run. 5. Waste Treatment - domestic and factory wastes if not properly segregated and treated can lead to release of dangerous gases. Improper waste disposal like burning etc leads to high CO2 and other dangerous emissions in the atmosphere. 6. Tree planting - is a Carbon-offsetting measure. Massive tree plantations help to capture CO2 from atmosphere. 7. Plastics usage - globally as of 2016, a total of 335 million metric tons of plastics have been used from a meagre 1.5 million metric tonnes in 1950, an average growth of 22300% growth, i.e. a growth of 328% every year over the past 68 years. Plastics by nature takes hundreds of years to disintegrate and degenerate. The micro-form of these plastics has entered the food chain through the oceans and the fish population. These foreign elements in our human bodies are the greatest disaster and we are inviting cancer with open, welcome hands. 8. Traffic related - Bangalore is known for the pathetic traffic conditions, excess vehicle population in comparison to the length and width of roads, the rapid industrialization of Bangalore since the 1990s has seen a burst in metropolitan vehicular population. 9. Carbon capture and sequestration - is an advanced method of offsetting carbon emissions captures atmospheric carbon dioxide from fumes, industrial and vehicle emissions and places them in vacant oil wells and other geological formations underground. Of all these, energy generation and plastics appears to be the worst polluters in Bangalore now. China, Vietnam, Philippines, Indonesia and Thailand (CVPIT countries) jointly consume annually 50% of global plastics, ie. 167.5 million metric tonnes. If we were to look at individual countries' plastics production, China tops the world with a production of 84 metric tonnes as of 2016. United States (US) follows behind with plastics production of 33.6 million metric tonnes of production (as of 2017). The benefits a Carbon-neutral Bangalore can bring is mani-fold, less traffic congestion, time savings, a higher quality of life, cool environment, healthy living and low incidence of cancer. we should start at the very basic level of a house or apartment, look at commercial installations and then cover large organizations, industries, townships and the like .. Global IoT market and competing standards . Checklists - importance and benefits ..
A season with Pandit Jawaharlal Nehru ..